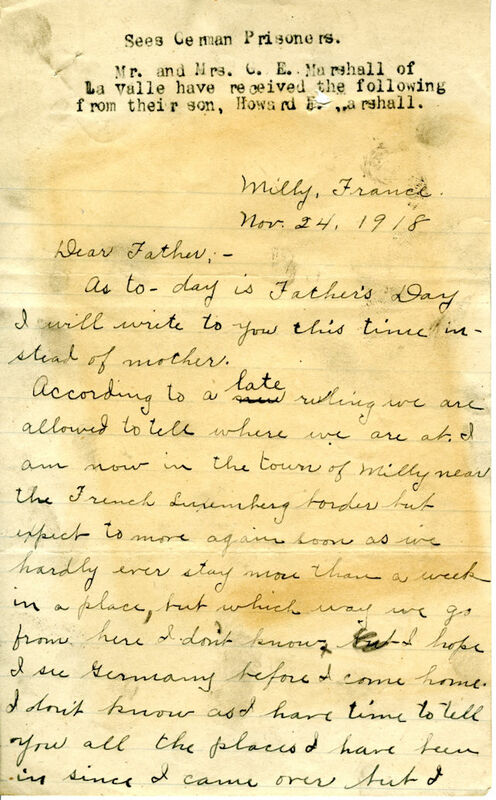 As to-day is Father’s Day I will write to you this time instead of mother. According to a late ruling we are allowed to tell where we are at. I am now in the town of Milly near the French Luxemberg border but expect to move again soon as we hardly ever stay more than a week in a place but which way we go from here I don’t know, but I hope I see Germany before I come home. I don’t know as I have time to tell you all the places I have been in since I came over but I will tell you that I landed at Liverpool, England & then across to Southampton & then crossed the channel to Havre, France. Have been on five different fronts & seen all kinds of guns & war material. Have seen all kinds of German prisoners too but will tell you all I have seen & done when I get back which I don’t think will be very long now. Well Dad I guess I will close with love to all & take good care of yourself for a little while longer. Ordnance Repair Unit M.T.O. (sic) 5th Div. (At the top of the letter is the following: Sees German Prisoners.